I've been doing this job for longer than I ever expected to. Hell, I never expected to be doing it at all for that matter. Even though I have been doing it for a long time I still catch myself staring at things in wonder at how beautiful the world can be. I don't know how often I have seen a calf born but the other day the wonder of it all struck me again. Here was a first calf heifer, with no idea what is going on, struggling to have a calf. The uncontrollable urges to push kept coming strong and furious. She was confused and upset by it all but continued her pushing until finally with a very loud bellow of pain, the calf comes out. She rolls up off her side, happy that the pain is gone, when all of a sudden there is movement behind her that catches her eye. You can just see the confusion in her eyes as she looks back at this wet, sodden mass that is starting to move. Then she catches the smell of it and it smells, "right" somehow. She moos lightly at it and it moves again and then it's too much. She excitedly jumps up and spins around and starts smelling this wet, lump on the ground. The wet lump smells right and she starts "talking" to it, and the smell makes her want to lick it. She starts licking the wet thing and it tastes "right." So there she stands, licking her new calf, mooing to it and taking care of it. The calf in turn hears its mom talking to it, learning who its mom is, and feels mom tongue licking it stimulating blood flow through the body and causing him to want to get to breathing all on his own. In all this pain and confusion of being born and mom assaulting his senses, he gets hungry. He struggles to get to his feet. He falls, and shakes it off and tries again, This can happen many times before he finally gets steady enough on his feet to start to maneuver around and look for something to eat. All the time this is happening, mom is mooing to him and licking him for all she is worth. The calf at this point smells the milk, he knows where to go to get it if mom will just let him. He tries to get to moms side but she won't let him, she wants him at her head. They do this dance for awhile until finally mom decide she can lick him and moo at him at her side just as easily as if he were at her head. The calf now has the teat within reach, he can smell the food and tries to figure out how to get it. After quite a few attempts he finally gets a hold of a teat and starts to nurse getting that warm milk in his empty belly making him fell very warm and good. When his belly is full he gets very tired and lethargic, the calf wants nothing more than to lay down and sleep which he does. Invariably at this point the mom will lay down beside the calf, touching him, so that she knows he is there and can provide some extra body heat to him to keep him warm. Think about this, after all the pain and agony of delivery, this heifer who has no idea what is going on, is urged by instinct to lick her baby so that the blood gets to flowing and the lungs get to working to deliver air to this calf. She "talks" to it so it gets to know her voice and she can encourage it to get up. The calf stands up, sometimes within a few minutes of birth, finds his way to the food center, learns how to nurse, and gets a belly full of warm milk to get it started in life. The whole process of how it works is simply amazing if you step back and look at it and not just accept it as a fact of life. God/Mother Nature really provided such an amazing ability that it really makes me scratch my head in wonder that it works. Oh, don't get me wrong, we have the occasional misfire where the heifer won't take care of the calf, or the calf has a hard time finding a teat or some other problem but it doesn't happen very often. It's just amazing to step back and take in the wonder of it all sometimes. To slow down and appreciate what you are seeing instead of just running through life and taking it all for granted. I challenge everybody out there to do the same thing, slow down and take in the beauty of some common, everyday thing you take for granted. It will amaze you. I've been trying to get a handle on what is going to happen to cattle prices with the Ethanol boom driving corn prices so high. Part of this story finally clued me in to the best explanation I've seen. What might be really ridiculous is corn going to $4 a bushel. Michael Swanson spent the noon hour trying to explain how that was going to affect the feeder calf and slaughter steer market. Swanson, who is an agricultural economist for Wells Fargo, indicated he was bullish on cattle prices but was not so sure about profits. The difference is that input costs for production could easily outstrip the higher cash return per pound of beef. But, in what sounded like a contradiction, Swanson said higher corn prices would mean lower slaughter weights, which means less beef in the supply chain while actual demand for beef will continue to rise - or a need for more cattle to supply the beef, meaning higher cattle prices. "The key (to this scenario) is, will ethanol production keep corn where it is at ($3.50 a bushel) or even higher?" he said. He said 20 percent of the U.S. corn crop of almost 11 billion bushels a year is now used for ethanol production, primarily in the Midwest. The success of the ethanol industry depends on the price of oil staying somewhere between $40 and $100 a barrel. Predictions of 30 percent of the corn crop going to ethanol could make corn way too expensive to feed to cattle and would force those lower slaughter weights he spoke about. Corn substitutes such as barley and sorghum will benefit farmers who raise those crops, he said. Let's see, feeders will feed to lower weights causing a contraction in the meat supply which will cause prices to go up. The higher price will offset the higher price for feed so hopefully their profit/loss scenario won't change. If that's the case, the price they are willing to pay for calves will either stay the same or go down slightly. 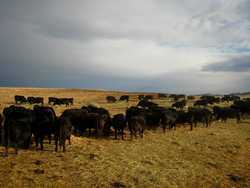 Cow-calf producer's profit will depend on how much grain they feed their critters before they sell them. People like me who feed barely any grain products, just some cake in the winter, should be in pretty good shape in this scenario. Our costs won't go up very much with the rising grain prices. This is all assuming what this guy says is true. It feels right to me and I have learned to trust my instincts a long time ago on this kind of stuff, they have yet to steer me wrong. The cows deciding to eat the grass hay on a drier southern slope. They are looking good. Hope the weather holds. Taken 3/1/2008.